Renewable energy comes from sources that are naturally replenished. Natural occurring resources such as sunlight, wind, rain, ocean tides, and geothermal heat (geysers) can be utilized to provide energy without worrying about depletion. Modern renewable energy can be substituted for fossil fuels in four areas: power generation, heating and cooling, transport fuels, and rural/off-grid energy services. 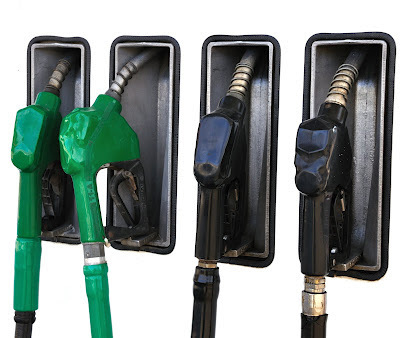 Biofuel promises an efficient, sustainable and renewable energy source for generations to come. It is derived through biological carbon fixation. Carbon fixation is the reduction of inorganic carbon (carbon dioxide) to organic compounds by living organisms. Biological material from living, or recently living organisms called biomass is processed to produce these biofuels. One such example of biomass source is algae. Since it can be cultivated in sewage water or saltwater, it does not compete with food crops in terms of land space or freshwater sources. A new process for converting municipal waste, algae, corn stalks and similar material to gasoline, diesel and jet fuel is showing the same promise in larger plants as it did in laboratory-scale devices, the developers reported here today. It was part of the 244th National Meeting & Exposition of the American Chemical Society (ACS), the world's largest scientific society, which continues through Thursday. "These results are essential in establishing the credibility of a process that may seem too good to be within the realm of possibility," said Martin Linck, Ph.D. "However, we are moving steadily toward having multiple demonstration-scale facilities in operation by 2014, with each facility producing a range of 3,500-17,500 gallons of fuel a day from non-food plant material. We will be designing commercial-scale facilities that could produce as much as 300,000 gallons per day from the same kinds of feedstocks." The technology, termed Integrated Hydropyrolysis and Hydroconversion (IH2), already has the credibility of its developer, the Gas Technology Institute (GTI), where Linck is a scientist. Located in Des Plaines, Ill, GTI is a nonprofit energy technology research organization whose accomplishments during the last 70 years include nearly 500 products, 750 licenses and more than 1,200 associated patents. IH2 technology involves use of internally generated hydrogen and a series of proprietary catalysts, which jump-start chemical reactions that otherwise would happen slowly or not at all. The process uses as its raw material, or "feedstock," virtually any kind of nonfood biomass material — including wood, cornstalks and cobs, algae, aquatic plants and municipal solid waste ― and produces gasoline, jet fuel or diesel fuel. 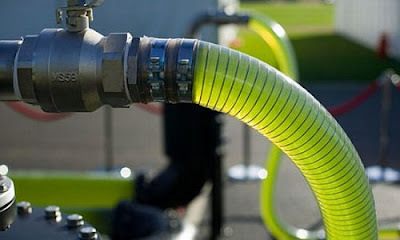 Linck said it differs from other biofuel technologies in producing a finished, ready-to-use liquid hydrocarbon fuel, rather than crude intermediate substances or substances that contain unwanted oxygen, which must be further processed and upgraded to meet specifications for transportation fuels. He cited other advantages of the IH2 technology, including flexibility to use a broad range of feedstocks and mixtures of feedstocks from different sources; the use of existing technology and equipment, which keeps its cost low; and production of 90 percent less greenhouse gas per gallon than fossil fuels. CO2 is the major greenhouse gas in this case. The process does not require external hydrogen gas since it produces its own directly from the biomass feed ― a key advantage because most hydrogen gas today is made from natural gas or coal. Based on assessments by the U.S. Department of Energy's National Renewable Energy Laboratory in Golden, Colo., IH2 technology has the capability to produce gasoline at a cost of less than $2.00 per gallon, Linck said. GTI is currently operating two pilot plants to test and refine the process. Both use wood, corn stalks and leaves or algae. The smaller plant has a capacity of just one pound of biomass per hour, and can produce 72-157 gallons of fuel per ton of dry, ash-free feedstock, depending on feedstock type. The second plant can handle more than 100 pounds of biomass per hour and is designed to operate continuously, like a commercial facility. Linck's ACS presentation focused on experimental descriptions and yield data, demonstrating that the performance of the larger, continuously operated plant is in line with results obtained on the smaller plant. Linck said GTI has licensed the IH2 technology to CRI Catalyst Company (CRI), in Houston, Texas. CRI has exclusive sub-licensing rights to the process and is working with multiple customers wishing to build several demonstration units that can convert between 40 and 200 tons of biomass a day. GTI anticipates full-scale commercial plants converting 2,000 tons a day will be operating by 2014. Such a plant could produce more than 300,000 gallons of fuel a day, if the larger scale plants operate at the same efficiency as the pilot plants. "Full commercial scale will be dependent on client location and feedstock specifics," Linck said. "Our preliminary engineering estimates are using 2,000 ton per day of feedstock, but this will depend on feedstock type. For example, municipal solid waste plants may be smaller, and plants converting wood may be larger. Gas Technology Institute's (GTI) Integrated Hydropyrolysis and Hydroconversion (IH2) is a new thermochemical process that employs a catalyzed fluidized bed hydropyrolysis step followed by an integrated hydroconversion step to directly convert biomass into high-quality, fungible hydrocarbon fuels. IH2 derived fuels contain less than 1% oxygen and are completely compatible with petroleum derived fuels. Based on data from extensive bench-scale testing with wood and corn stover, and a Life Cycle analysis from Michigan Technological University, IH2 provides a green house gas (GHG) reduction of over 90%, compared to petroleum derived fuels. Finally, economic analyses carried out by the National Renewable Energy Laboratory, NREL, with capital cost verified in a study by KBR, shows IH2- derived gasoline and diesel can be produced at less than $2.00/gallon. Catalyst for the IH2 Technology is specialty catalyst supplied by CRI Catalyst. Initial IH2 testing and analysis has been done based on data obtained from a semi-continuous 1lb/hr bench pilot plant. In this presentation we will present new data on IH2 developed from a continuous 50kg/day pilot plant. IH2 yield data, product quality data and catalyst stability data will be included in the presentation. Data will presented for wood, lemna and cornstover biomass feeds. Next steps and plans for further IH2 development, catalyst testing and commercialization will be also be reviewed.